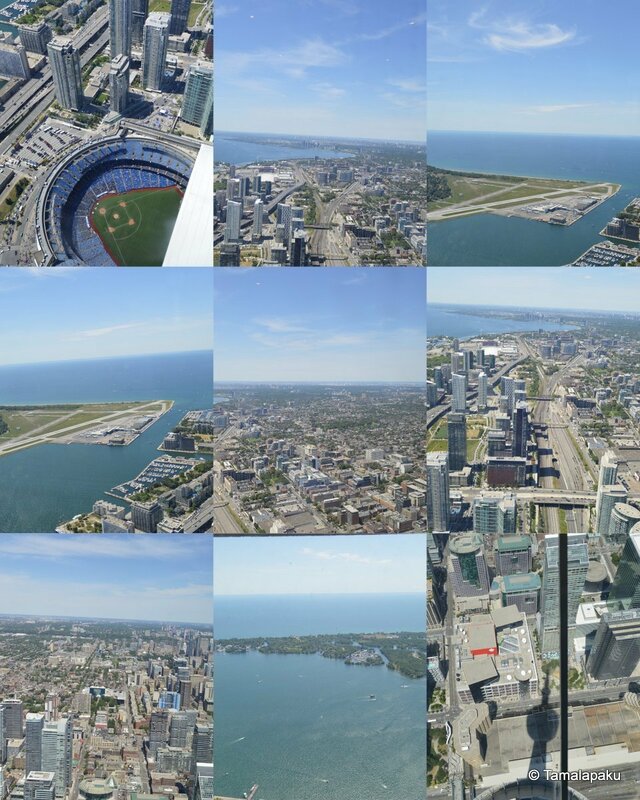 Day 30 of BM #56 - For the final day of this #BuffetOnTable, here are some snippets of our trip to the CN Tower, Toronto. On our final day in Canada, we had plans to cover the CN tower in Toronto and an African Safari on our way back home. Later in the day, we realized that it was not a practical plan to cover both the places in a single day. We convinced the kids we could visit the Safari at a later date as it was closer to the Border and was just about a couple of hours drive from home. The kids were a tad disappointed but they soon got carried away with the excitement of the view from the top of the tower. Since we had purchased the entry tickets to CN tower online, we saved the waiting time there. But we still had to brave long queues to go to the top of the tower to have a thrilling experience. We had some snacks to munch on and so the kids had a difficult time complaining about the long wait :). I wonder why I didn't carry this Chivda on that trip. Or maybe my friend got it but left it in the van!! *An elevator which takes about 58 seconds from the ground level to the observation deck. *A glass floor in the Indoor Observation Level, on which we could sit/stand/lie down and view the streets from a height of around 342 meters. And obviously tons of pictures were taken as I was the chief photographer. A few more pictures.. Since the weather was very cooperative, the whole trip was a pleasant one. So that was how we recharged ourselves in 3 days!! In a wok/kadai heat oil and fry the corn flakes until they puff up. Transfer them onto paper towels to absorb the excess oil. Fry in batches until done. In the remaining oil fry the peanuts. In a wide bowl, mix the fried corn flakes, peanuts and roasted gram. Sprinkle salt, turmeric, red chili powder and amchur powder. Toss the mixture and serve it with coffee or tea. Store in an air tight container for up to a month. As narrated yesterday, we drove to Canada in the idyllic countryside to reaach the Niagara Falls. 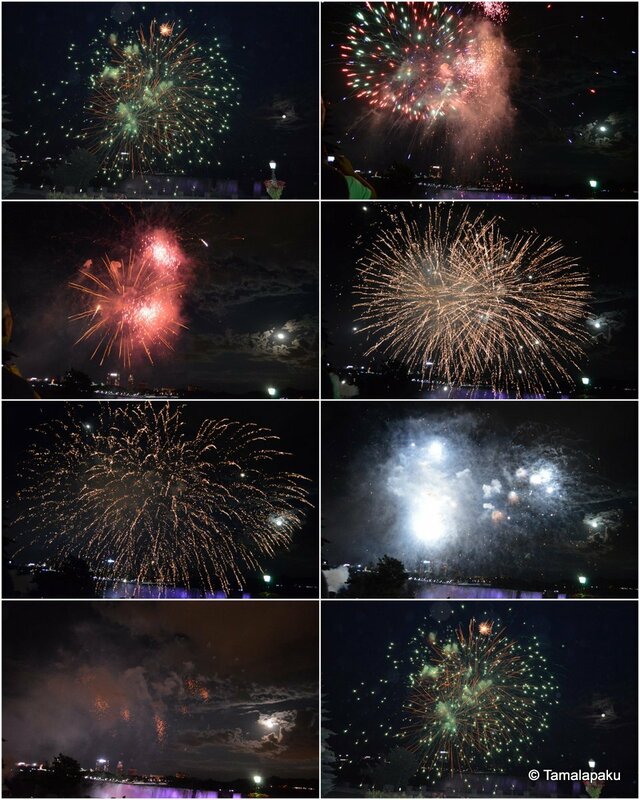 There we experienced the beauty of the fireworks on a full moon night. We then drove to a hotel which was a waterfront property and had a fantastic view from the breakfast nook. A walk along the small bridge (as seen in the picture below) on a full moon night was breath taking to say the least! Talking of breakfast, they had an excellent array of breakfast options which we all enjoyed. Combine it with the beautiful view, pleasant weather, we had an excellent start for the day. Off we went to the numerous rides/shows experiencing Nature in its glory and fury. Here are is a collage of some pictures before we take a look at another breakfast we had. I had posted earlier in the month the full spread of the breakfast tray. Now, on to the recipe.. In a heated pan add the butter and saute the potatoes without using a spatula. Just toss them around until they turn a shade of brown. Sprinkle all the spices as needed and serve warm and crisp. Background - Two mini vans, 3 families, loads of snacks, Sandwiches, Idlis, Yogurt Rice, Soft Drinks and Juices. Lush green fields surrounded us, seemingly endless, as we crossed the border. The sight of so many windmills towering over us was very exciting. Such scenery left us all in awe. As we neared the Niagara Falls, to our delight, we spotted a double rainbow. The weather was perfect - Not too hot, not too cold, with a gentle breeze. With such excitement, we drove for about 3 hours through the beautiful country side. 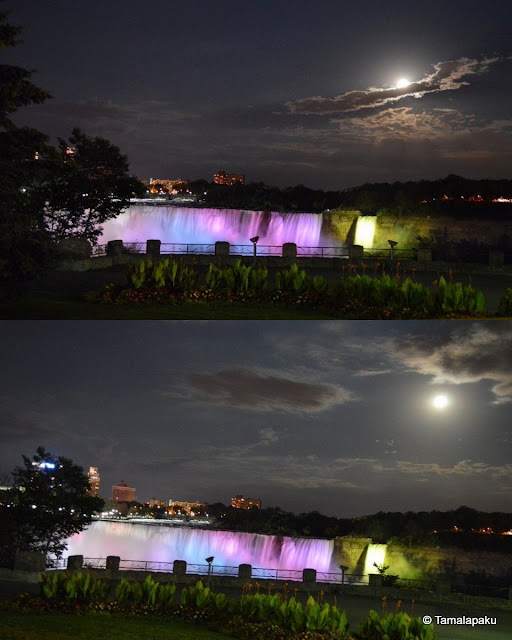 Upon reaching the Niagara Falls, we promenaded along the falls, taking pictures from various points. We were told that there would be fireworks on Fridays and Sundays. That being a Friday, we were trying to locate a good place to relax and enjoy the fireworks. 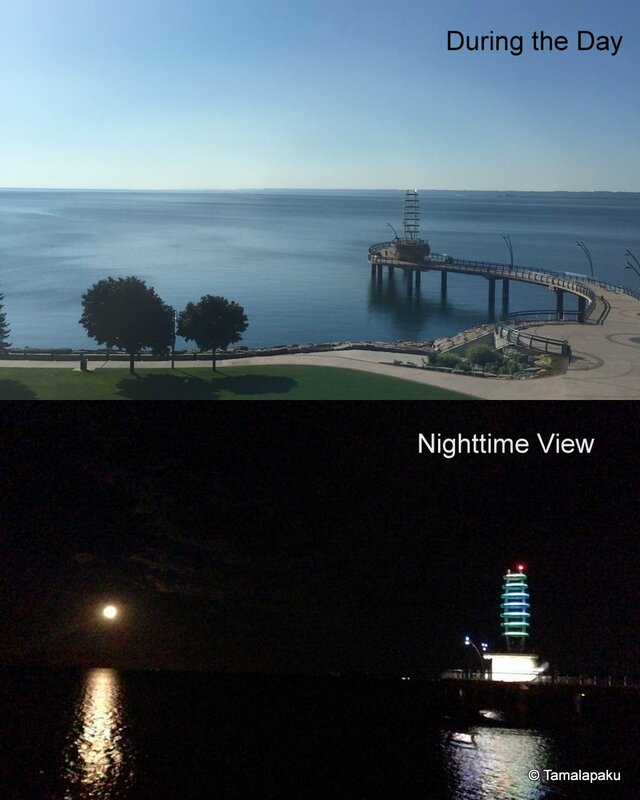 A full moon night, beautiful weather, colorful surroundings, wonderful friends and fireworks. We then drove to our hotel which was about 45 min from there amidst a heavy downpour. We were lucky to miss the rain by a few minutes at the Falls. Upon reaching our waterfront hotel, we unloaded the Idlis, Peanut Chutney and Yogurt Rice along with some cucumber sandwiches and had a sumptuous dinner in our hotel room. Exhausted after a long day, we all crashed for the day making plans for Day 2. Today will be the last of International Breakfast series in this series of #BuffetOnTable. Congee in Chinese, Kanji in Tamil, Ganji in Telugu, I see some similarities in the names, Do you too? Different versions of the same Rice starch based concoction. I was very skeptical of this starchy soup when I made it. But after tasting it I had to change my opinion. The crunch of the peanuts was the highlight of this porridge/soup. In a pressure cooker, add the washed rice, water, ginger and salt. After a couple hisses, remove from heat. After the pressure cooker is cool enough, blend the cooked rice into a smooth puree. Boil the vegetables separately. Add the boiled vegetables to the congee. Sprinkle pepper and squeeze in the lime juice. These sandwiches are traditionally Greek. This version was liked by my older one. These kind of open sandwiches are very popular in many European Countries. In one half of the bread, layer the veggies and the protein being used. Pour the Tzatziki sauce, fold it like a taco and serve immediately. These pancakes are the latest favorite at our place. The kids and their friends are waiting for the next batch of these pancakes :). Anyway, these are my version of the traditional Dutch Apple Pancakes. I found many versions where these pancakes were described as eggy, puffy and many were baked in a cast iron skillet. Apparently these pancakes are reserved for Sunday Breakfasts in many families. In a skillet, heat 1/2 tablespoon of butter and saute the chopped apple until they are brown all over. Blend banana, milk, brown sugar, cinnamon powder, nutmeg 1/2 tablespoon of butter and flour into a smooth puree. Grease a shallow baking pan, arrange the sauteed apples on the greased pan. Pour the batter evenly onto the apples. Bake it for 15-17 minutes until it sets and browns evenly. Remove and set aside for a few minutes. Serve warm. This Moroccan Bread is traditionally made with plain flour. But to make it a little healthier, I picked this recipe which uses mixed flours and is slightly dense in texture and wholesome too. I would have loved to have some soup to go with this bread, but due to lack of time, I served it with jam and Olive Oil dip. Proof the yeast in warm water with sugar. Whisk the flours, salt and the olive oil. Pour the frothed up yeast solution into the flour and knead into a soft dough. Divide the dough into 5 equal portions and pat them into 1/4th inch discs. Place them on a greased baking tray. Cover with a moist towel. Preheat the oven to 350 °F. Remove the wet towel and bake for about 20 minutes. Serve them warm with either Olive Oil or any jam of your choice. This is a delightful version of cereal from our childhood. I remember that my mom used to make (still makes it for my dad?) the crunchy puris for me and my dad. This is how we loved to have puris. My brother and mom always went with the traditional Puri-Sagu or Puri-Chole combinations. When I made this and introduced our childhood 'cereal' to my kids, they fell in love with it instantly. Serve this way to the kids and check if they love this version. The puris can be made ahead of time and stored in air tight containers. I am surely going to make the baked version of the crunchy puri and have this for my breakfast :). In a mixing bowl, add the flour, salt, ajwain and knead into a stiff dough adding as much milk/water as needed. Cover and set aside the dough for about 30 minutes. Heat oil in a kadai/wok. The puris can be made in any shape and size as they would be crushed in milk eventually. Pinch a big lemon sized portion of the dough and roll into a paper thin disc. Poke with the fork tines all over. Using a pizza cutter, make small pieces of the disc and gently slide into the hot oil. On a low heat, fry them until they are golden brown and crisp. Remove on to the paper towels to drain the excess oil. In a bowl, add warm milk and sugar as needed. Crush the crunchy puris into bite sized pieces and add it to the bowl of milk. Let it sit for a few minutes if needed, to soften the crushed puris and enjoy! 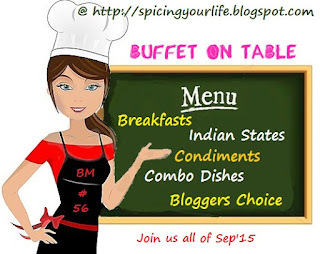 The third week of this edition of BM(#BuffetOnTable) will see us blogging breakfast recipes from across the globe. In the summer vacation we made a brief trip to Canada with a couple friends and their families. It was so much fun to travel with friends. I shall write more about the journey itself later in the month. But today it is all about the complimentary breakfast we had at the hotel we stayed. There was the usual fare of three different types of cereals, juices, toast, butter n jam, fruit, hash browns, eggs etc. But what interested my kids were these raisin bran muffins . So I made these at home. The texture was different because those muffins used the Wheat bran instead of the bran flakes. But taste wise they came very close. * I removed the raisins from the Raisin bran cereal and then crushed the flakes. I added the raisins to the flour. In a mixing bowl, add the flours, crushed raisin bran, baking powder, salt, flax seed meal, cinnamon powder, nutmeg powder and the raisins from the cereal. Whisk well. In another bowl, mix brown sugar, oil and milk until the sugar dissolves. Add it to the flour mixture and gently fold the mixture until well combined. Line the muffin pan with liners. Fill the muffin cups with the batter. Bake in the center rack of the oven for about 15 min or until the tester comes out clean. For the last day of posting these simple and delightful condiments, check out this yogurt sauce(Raitha) which the Greeks serve with Gyro Sandwiches (Recipe soon). To me Raitha is an accompaniment with Pulao, Biryani and the like or even eaten as such. But this sauce apparently goes with Sandwiches. My older one certified that it sure tastes awesome with the Gyro sandwiches. So here we go..
Salt the cucumbers and let them rest for a few minutes. Squeeze out the water from the cucumbers. In a different bowl, whisk the yogurt, pepper, lime juice, dill, mint and garlic. Add in the cucumbers and refrigerate for an hour for the flavors to blend in. The Greeks serve it with Gyro Sandwiches. As part of the Maharashtrian Thali, I had made this condiment to add some zest to an already comforting meal. We make Peanut Powder with red chilies. But adding green chilies brought out a unique taste to this thecha, more like a dry peanut chutney :). In a heated pan, roast the peanuts, sesame seeds, chopped green chilies, garlic separately. Grind all of them coarsely adding as much salt as needed. Serve it with rice and Dal. It stays fresh for a couple of days in the refrigerator. Guacamole is a dip which we love in anything and everything. We love it on burgers, as a spread on breads, as a dressing on salads etc. So when I found another version of guacamole having another of our favorite vegetable, celery, I had to make it and we all loved it with tortilla chips. Blend chopped avocados, celery, lime juice, salt, jalapenos, garlic into a coarse mixture. Garnish with chopped onion and cilantro. Serve with Tortilla chips or as a spread as needed. For today, let us check out a no nonsense, healthy home made ranch dressing. My older one is very fond of salads but the dressing puts her off because of the over powering smell of vinegar in there. This ranch was perfect for her and all of us enjoyed our share of salad. I guess this qualifies to be part of the American cuisine. Blend all the ingredients until the oil is incorporated. Serve immediately on a choice of salad or store in an air tight container in the refrigerator.